Mitochondria further depend on the import of about 1,000 types of protein from the cytosol. The translocase of the outer membrane, also termed TOM complex, forms the entry gate for the precursor proteins. The import of carrier proteins is particularly important for mitochondrial metabolism. Carrier precursors pass the outer membrane via the TOM channel. Subsequently, helper proteins, the small TIM proteins, guide the precursors to the inner membrane. The carrier translocase, the TIM22 complex, integrates the precursors into the inner membrane. How the single transport steps of the carrier import pathway are connected to each other was not previously known. Researchers at the University of Freiburg discovered an unexpected function of the metabolite channel porin/VDAC in protein import into mitochondria. 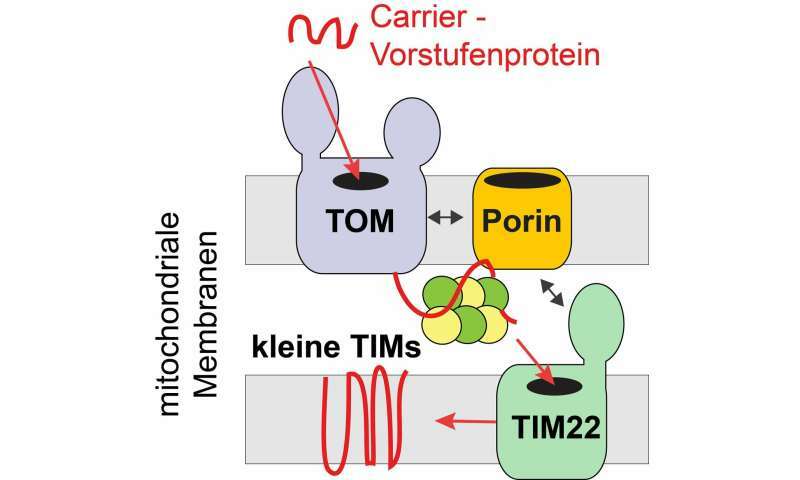 Dr. Lars Ellerieder from Thomas Becker`s research lab showed that porin/VDAC stimulates the import of carrier proteins into the inner membrane. The function of porin/VDAC in protein transport occurs independently of its channel activity. Instead, porin/VDAC acts as coupling factor. The proteins binds to carrier precursors in the intermembrane space, to the TOM complex and the carrier translocase. Thus, porin/VDAC spatially links the single transport steps, and thereby stimulate import of carrier proteins. The researchers demonstrate that mitochondrial metabolite and protein transport are connected: "The role of porin/VDAC in protein transport could represent an elegant mechanism to fine-tune import of carrier proteins and therefore eventually metabolite transport to meet the requirements of the cell," explains Becker.